Synopsis: The novel is about a boy called Thomas, he wakes up without his memory, only knowing his first name. Thomas is not alone, there are kids who are also in the same situation and have been in the lift. They all welcome him to the Glade. Nobody knows how or why they were sent here the only thing they know is that they are surrounded by a maze which the doors open to every morning and close at night. I really enjoyed this a lot. First of all I like how it just plunges straight into the story, it didn't take up the first chapter to explain what was going on, you kind of figured it out along the way. It starts of with Thomas being totally clueless as to what is going on. He is constantly demanding answers only to get a vague sentence and shut down. The way that Dashner explains their environment is very vivid and I can see everything so clearly in my head. I really enjoyed the world building and the character development. I am very much looking forward to the next instalment and I can't wait to see what happens next. Thomas was constantly saying how he wanted to become a runner so I thought it was quite obvious there would be some way that he would get what he wanted. What I was not expecting was that he would go into that maze after Minho and Alby, he was a pretty brave shuck to do that (haha get it ). One thing that I found strange was the fact that there were no girls and you don't really realise until the girl (Teresa) comes through the lift with the note but the boys all act as though its not strange?! honestly you would think they would be wondering why there are only boys in the glade? I had this theory that the grievers took their victims bodies into the griever hole and got revived but they were not themselves. 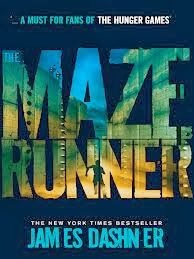 I then get to the near end of the novel, the gladers escape and there is Gally (who was dead!) standing there, it made me wonder if my crackpot theory was right. Gally was almost like a puppet for the scientist, in that moment I felt sorry for him because even though he was a bit crazy, he did not have the choice in pulling the trigger or not. When Chuck dodged the bullet for Thomas it shows how much courage and compassion he had. I could feel Thomas's pain for the loss of Chuck, even though he was annoying to him at times, he was still one of his first friends he made at the Glade and he had made him a promise which he could not keep now that he was dead. I recommend this to anyone who loves a good dystopian, Young adult or anyone just looking for a good read because honestly you will not be disappointed it is so good. If you have not read this yet, seriously go pick it up you will not regret it!